Languages : Tamil, English & Marathi. Temperature : Max. 36.6° C and Min 32.5° C in Summer. Max. 23.5° C and Min 28.8° C in Winter. Visiting Thanjavur is something like visiting a live museum. Every road and corner breathes history and heritage. Culture is in the air in this town, which is also known for its green pastures and lush paddy field. Temples, idols, paintings, art works, Thanjavur like Rome in Europe or Egypt in Africa. Thanjavur has received international reorganization and notice for its rare monuments. The awesome Brahadeeswarar Temple, has been declared a World Heritage Monuments by UNESCO. Air: The nearest airport is 55 km from Tiruchirappalli, which is connected by Indian Airlines and Air Lanka. Rail: Thanjavur is connected by rail with Tiruchirappalli, Nagore, Thiruvarur, Mysore, Tirupathi, Rameswaram and Chennai directly. Road: Thanjavur is connected with all major cities by road. Regular bus service connects places of interest in and around Thanjavur. The Palace: Just one km from the Brahadeeswarar Temple is a magnificent palace, surrounded by huge fort wall. It was built dating back to the 14th century A.D. It is fascinating building with huge corridors, spacious halls, decorated rooms, tall observation tower, beautiful stucco work, wonderful fresco painted wall and ceiling, an underground tunnel and intricate curving. “Chandramauleeshwarar Temple” lies within the palace walls. Art Gallery: The art gallery has a fictitious collection of bronze icons stone culture and pieces of art. The collection is unique for its large representation of Hindu Gods and Goddesses, myths and legends. The exhibits are priceless for their historical association. Saraswathi Mahal Library: The Thanjavur Maharaja Serfoji’s Saraswathi Mahal Library is one among the few libraries in the world with texts of the medieval period. It is a treasure house of knowledge. It contains a rare and valuable collection of manuscripts, books, maps and paintings of art, culture and literature. It is ‘the most remarkable Library’ in India. Royal Museum and Serfoji Memorial Hall: Located in the palace complex, it displays rare antiques belonging to the Maratha Royal family. The artifacts, manuscripts, weapons, royal robes and handicrafts made out of ivory, jade, glass, porcelain, wood, cloth and leather are worth seeing. Marattah Durbar Hall: It huge pillars, beautiful paintings and fresco-painted ceiling are eye-catching. Sharajah Madi: This is in the eastern part of the palace. It is six-storied and well known for its ornamental balconies. Its spacious halls bespeak the grandeur of this palace. 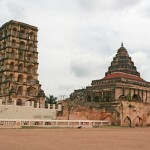 It enables tourists to have a panoramic view of Thanjavur City. Schwartz Church: This church was built adjacent to Shiva Gangi Tank in 1779 A.D. by Raja Serfoji as a token of his affection to his tutor Rev. C. V. Schwartz, a Danish missionary. Rajagopala Beerangi (Canon): This is a huge Canon placed at the eastern gate of the fort. The place is called ‘Beerangi Medu’. The Canon is amazing in size and the quality speaks of the metallurgical knowledge of the people of those times. The Canon is the biggest in India. Tholkappiya Sadukkam: This Sadukkam (square) was built during the 8th world Tamil Conference. One can have a panoramic view of Thanjavur town from the tower. Sri Brahadeeswarar Temple: The Brahadeeswarar Temple, called the big temple is dedicated Lord Shiva. 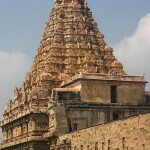 It is an outstanding example of Chola architecture. UNESCO has declared it a World Heritage Monument. Thiruvaiyaru: It is situated 13 km away from Thanjavur on the banks of the Cauvery. Thiruvaiyaru has an old Shiva Temple dedicated to Tanchanatheswarar. Pilgrims flock through this temple throught the year. Thiruvaiyaru is renowned for its association with Saint Thyagaraja, who constitute the Trinity of Karnatic Music. 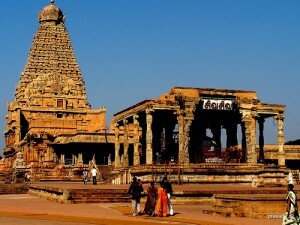 Thingalore: It is situated 18 km from Thanjavur. It is dedicated to Chandran means Moon. It attracts many pilgrims. Papanasam: Papanasam is a historical city, situated 30 km away from Thanjavur. There are famous temples one is the Pallaibanathaswamy Temple and the other is the 108 Shivalayan Temple, which has 108 Shiva Lingas. The granary constructed in 1600-1634 A.D. is a grand site. Swamimalai: It is situated 32 km away from Thanjavur. It is one of the six abodes dedicted to Lord Subramanya. The temple is beautiful. The handicrafts of Swamimalai are much sought after for their beauty and artistic value. Darasuram: Darasuram is situated 34 km away from Thanjavur. 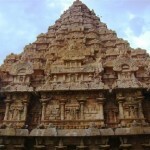 This temple is an example of 12th century Chola architecture. 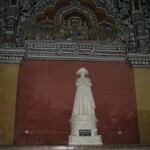 The frontal columns of the temple have unique miniature sculptures. Darasuram is also famous for silk weaving centre. Kumbakonam: It is situated 38 km away from Thanjavur. The four large temples- Sarangapani, Kubeswarar, Nageswara and Ramasamy temple- located here are noted for sculptures and curving. The Mahamaham festival, celebrated here once in 12 years is famous throughout the country. Upliyappam Koil: It is 6 km from Kumbakonam and 44 km from Thanjavur. It is dedicated to Lord Venkateshwara. 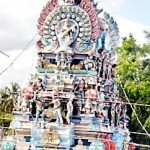 It is located on the bus route from Kumbakonam to Nachiaikoil. Thirunageswaram: It is 6 km east of Kumbakonam and 47 km from Thanjavur. It has a Navagraha Temple. Poondi Matha Basilica: This Basilica in Poondi village is a Roman Catholic pilgrim centre, situated 35 km away from Thanjavur. Accommodation is provided to the pilgrim by the church authorities. Grand Anicut: It is situated 48 km from Thanjavur. Karikala Cholan initiated construction of the Grand Anicut by raising flood banks in the river Cauvary to irrigate waste land beside the river. 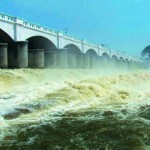 These ancient dams consist of a solid mass of rough stone and clay, stretching across the river Cauvery. It is a fine picnic spot. Navagraha Temple: Navagraha Temple is situated 58 km from Thanjavur. Suriyanar Koil, which means Sun Temple, is one of the Navagraha Temple dedicated to Lord Suryan. Gangaikonda Cholapuram: This temple, situated 71 km from Thanjavur, built by Rajendra Chola is very similar to the big temple at Thanjavur. It is an imposing Vimanam dominating the landscape for miles around. Nagapattinam: Nagapattinam is an important port town, situated 83 km from Thanjavur. 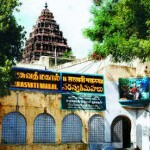 A temple dedicated to Nagaraja is located there. Thirunallar: It is a Shiva Temple situated 95 km from Thanjavur, a famous shrine dedicated to Saneeswaran. It is believed that one can get rigid of all problems and spells of bad luck if one pray here. Kodikkarai: It is situated in Thiruthuraipoondi Taluk 112 km from the Thanjavur on the northern point of Palk’s Bay. A bath in the sea at this palace is considered holy on the new moon day. This place is also noted for its congregation of migratory waterfowl, particularly flamingoes from November to January. This entry was posted in Tamil Nadu, Thanjavur. Bookmark the permalink.